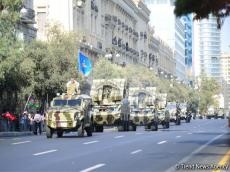 Azerbaijan’s draft state budget for 2019 envisages an increase in the funds allocated for defense purposes. In total, it is planned to allocate 3.037 billion manats for military spending. Out of these funds, it is planned to allocate 1.494 billion manats for defense forces and 156.989 million manats for national security. There are plans to allocate 2.8 million manats for carrying out applied research in the field of defense and security, and it is also envisaged to allocate approximately 1.4 billion manats for expenses not related to other categories. Defense expenditures amount to 2.9 billion manats in 2018.